With a ready-made hotpot base, your hotpot dinner is on the table within no time. Add the package content to the hot pot (boiling) water, add your preferred ingredients, and you’re ready to go. A selection of favorites. For some, it is hotpot blasphemy, but for others it is convenient and tasty: packages of ready-to-use hot-pot broth. 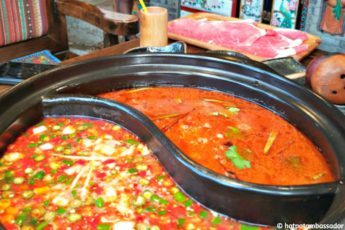 Of course, making your own hotpot base from scratch is fun and tasty (we will provide some recipes for that later), but there are great options for ready-made packaged hot pot broths around. All it takes is the right hotpot cooker, water, and the contents of your preferred hotpot broth package, and you are ready to go. 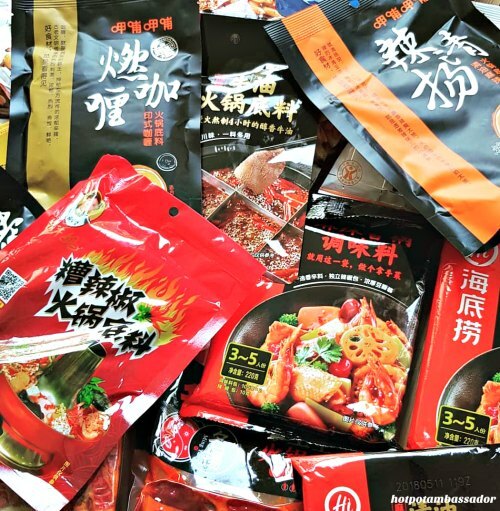 If you are located in China, you will find many options for hotpot broth seasoning at your local supermarket, and especially at bigger supermarkets chains such as Carrefour, Lotus, or Jingkelong. In Europe or US, there are also ample options, albeit more limited, but your local Chinatown supermarket will usually have a nice selection. There is always one good store around that excels in their selection; in London, it probably is the Loon Fung Supermarket, in Amsterdam, it is Dun Yong, in New York, it might be the Hong Kong Supermarket. 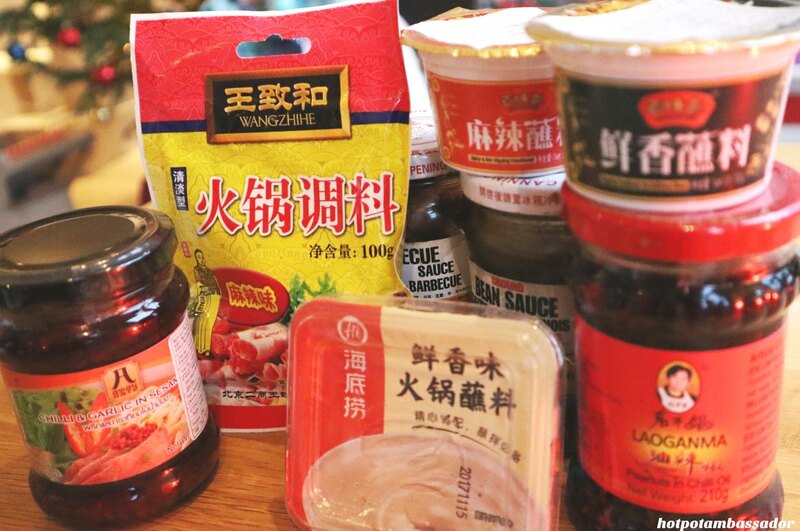 Many hotpot soup condiments are also available online through Tmall, Taobao, and internationally through Amazon. We’ll add links if available. The selection listed below include some of my favorite ready-made hotpot soup bases. Please note that these preferences are personal, so you’ll need to find out for yourself what suits your taste. I like really spicy broths, but there are some non-spicy options included, too. The order of these products is random, as I personally love all of these. The Laoganma brand is a great one. Not just for its taste, but also for its history. Tao Huabi (陶华碧) is the creator of one of China’s most famous chili sauces and her empire has grown into a household name since its founding in the 1990s. 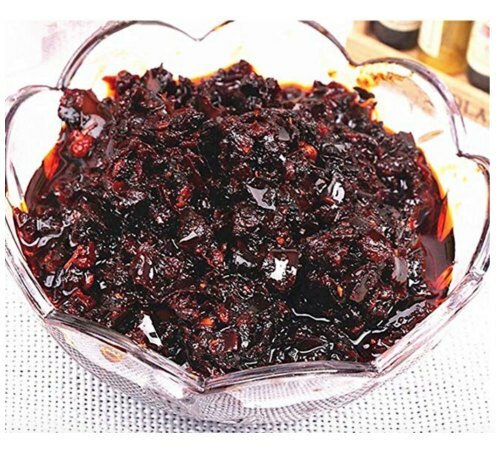 Laoganma became famous for its chili sauces in the 1990s. The brand literally means ‘Old Grandmother’ (老干妈). 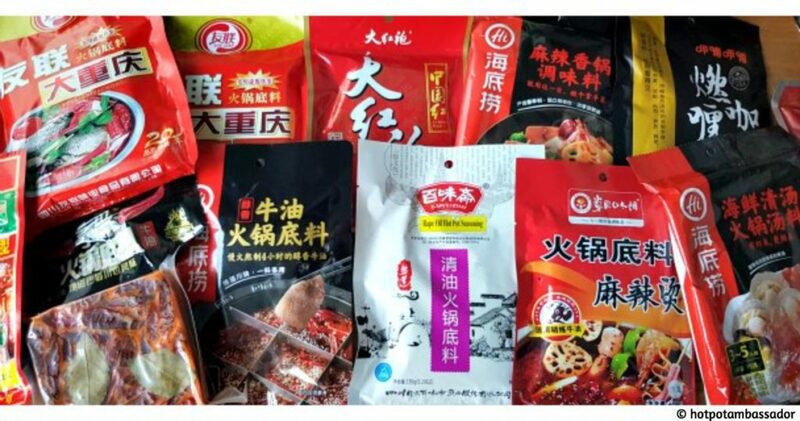 Laoganma is by far the largest chili brand of China, with over 20 differently-flavored condiments. 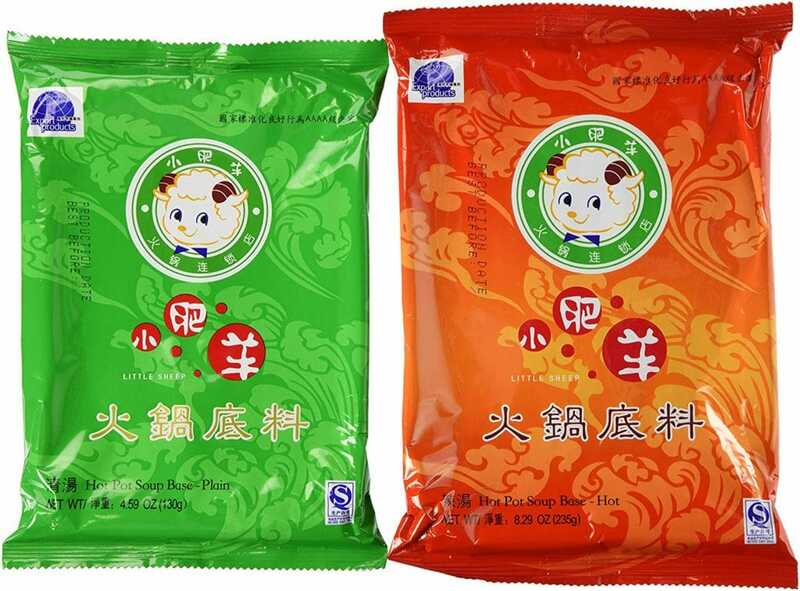 Their main hotpot condiment consists of soybean oil, chili, broad beans, salt, other spices, and flavor enhancer. It is more liquid than hard; it does not have a butter base. If you like the Laoganma chili sauce then you will very probably also love this hotpot condiment. 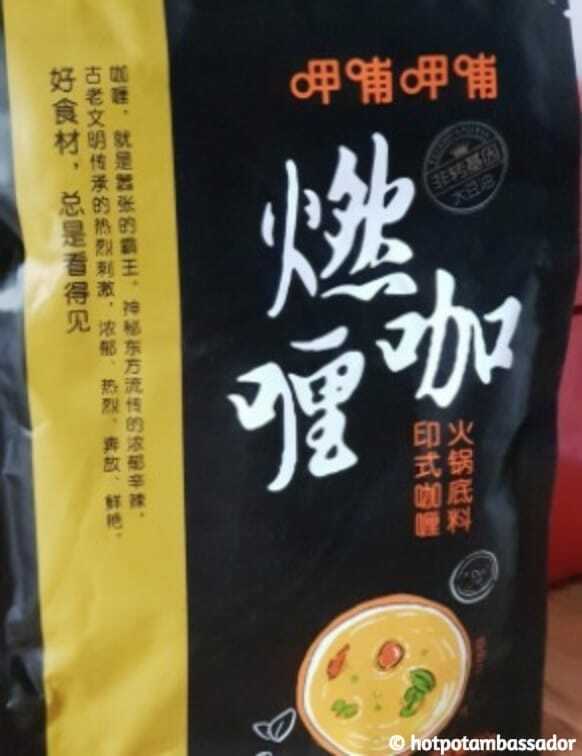 It has a rich taste, is spicy, and has that unique Laoganma flavor to it. This hotpot soup base is pretty widely available. 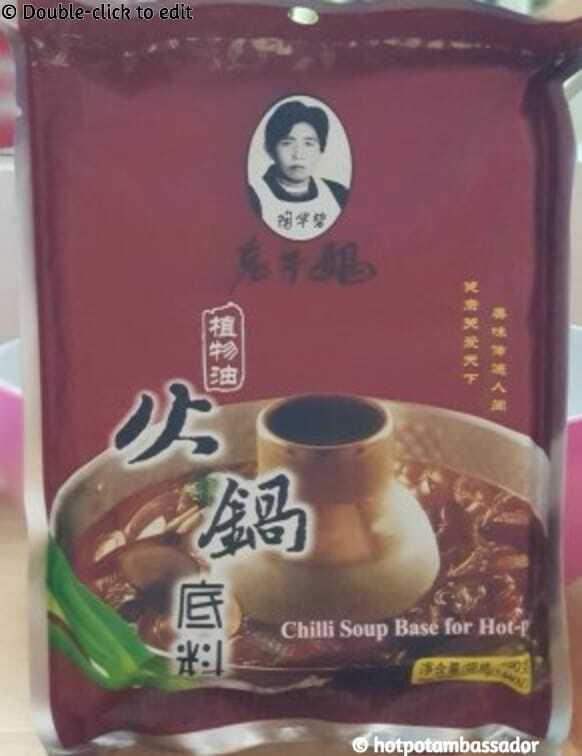 You can order it online through Taobao and Amazon here, but most local Asian supermarkets will usually also have this chili soup base in stock. One package has 160 gram of base in it (see image on the right for what the contents of the package look like). According to the cooking instructions, one bag of Laoganma Hotpot should be added to 500-550 ml of boiling water, and the broth will be fine within 2 minutes of boiling. Add some meat, vegetables, or seafood, and you’re ready to go! Since this soup base is pretty strong, you might want to add more than 500 ml of water. Also after simmering for a while and adding water to the hotpot, the flavor is still pretty strong. I saw this hotpot base at the Lotus supermarket in Beijing not too long ago, and really wanted to try it out just for how it looked: an orange butter base, bright red peppers, and the green spices, all concentrated as if it were a big block of soap of 500 gram – but I definitely would never recommend bathing with this one.. The brand that makes these soup bases is called Ming Yang (名扬火锅底料) from Chengdu, and they claim their soup bases are ‘handmade’ (手工全型). It is sold for around 30 yuan ($4,5) depending on where you buy it. You can get it in different flavors from mildly spicy to very spicy. Apart from in supermarkets, you can also get it on Tmall or Taobao. The block of 500 grams is more than enough for a very big pot of around 1500 ml, so if you’re planning on just a small pot, I’d recommend you cut it half and first try out if you like the flavor somewhat stronger or weaker (add more water). 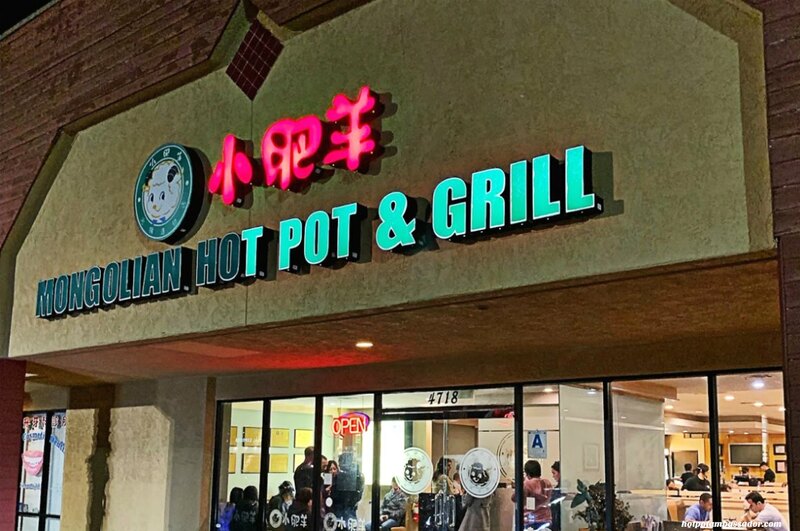 You can keep the rest of the block refrigerated for your next hot pot. 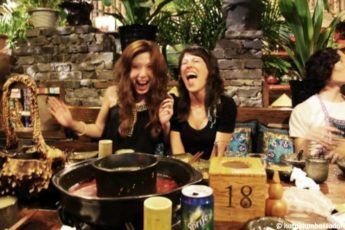 All in all, the taste is very authentic and the spicy version is especially suitable for those who love those rich spicy flavors from Chengdu. 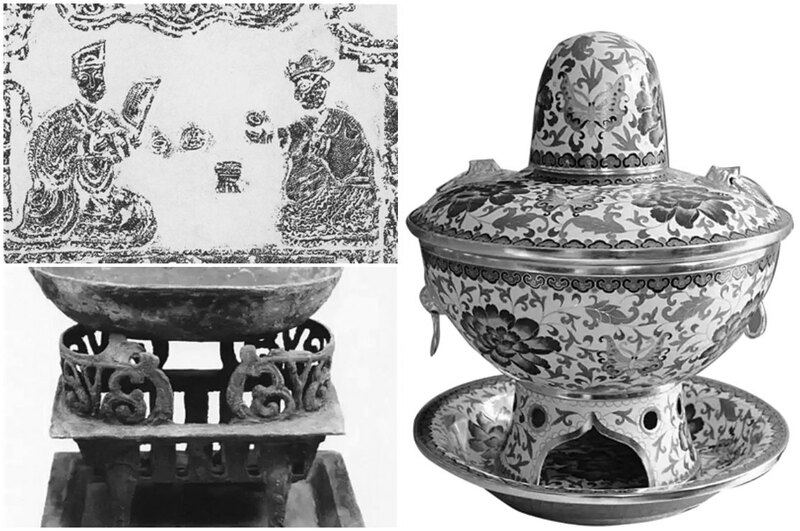 Haidilao also has a soup base that looks exactly like this one in the same style. Do mind that for some people, these butter base type spicy hotpots can cause some stomache aches, so be sure to prevent that with these tips listed here. 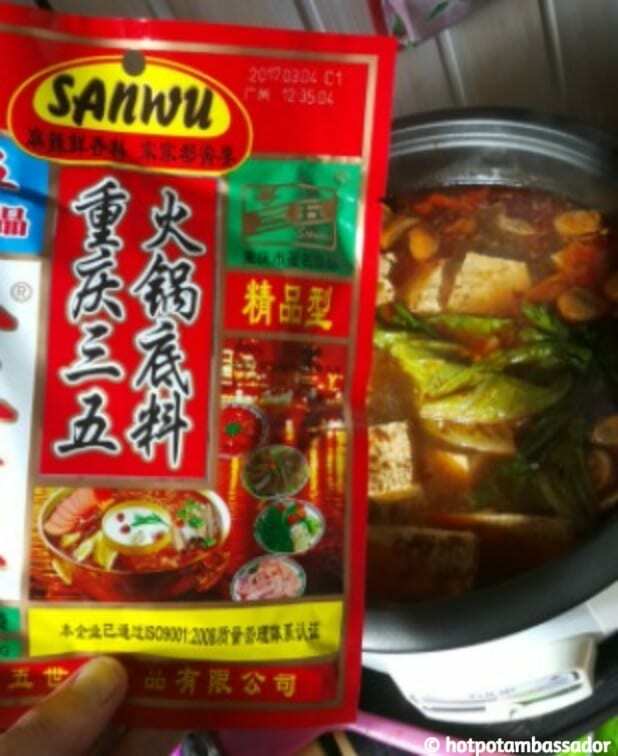 This Sanwu brand (三五重庆火锅底料) might very well be one of my very favorite hot pot soup bases because it tastes authentic, has that rich buttery flavor, is very spicy, and is actually one of the more affordable available selections in the supermarkets outside of China. 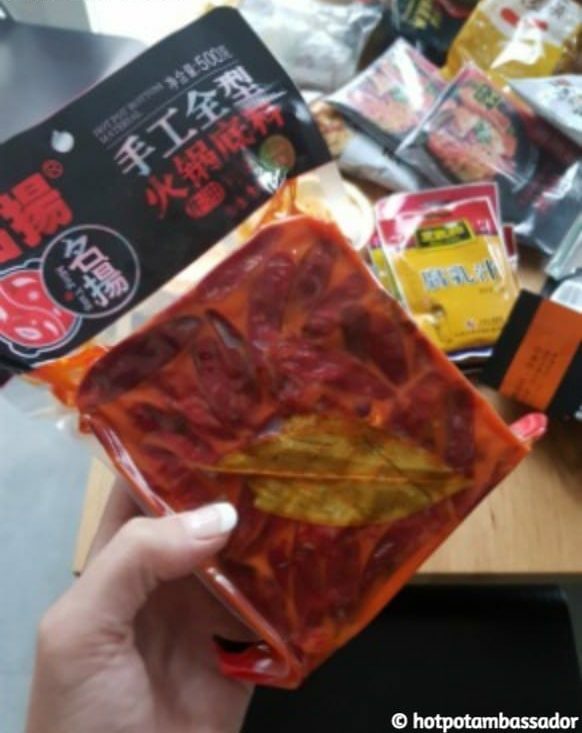 The condiment is produced in Chongqing and comes in packages of 150 gram. Like the aforementioned hot pot base, this is also made with butter. 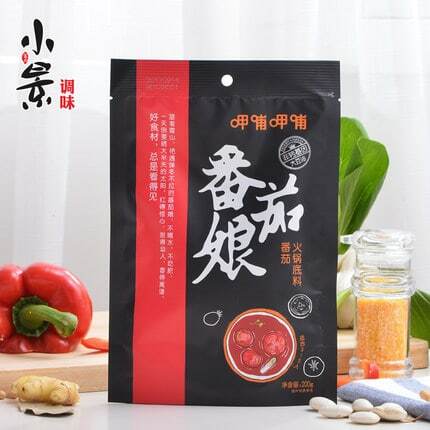 The other ingredients are vegetable oil, chili, broad bean sauce, Chinese prickly ash, salt, garlic, ginger, white granulated sugar, sesame, fennel, aniseed, along with additional spices. As in many of these soup bases, the flavor enhancer MSG is also used in this one. This small package alone is enough for a pot of 1 to 1,5 liter. It is sold on Tmall but also in many supermarkets in Europe, the US, or on Amazon. 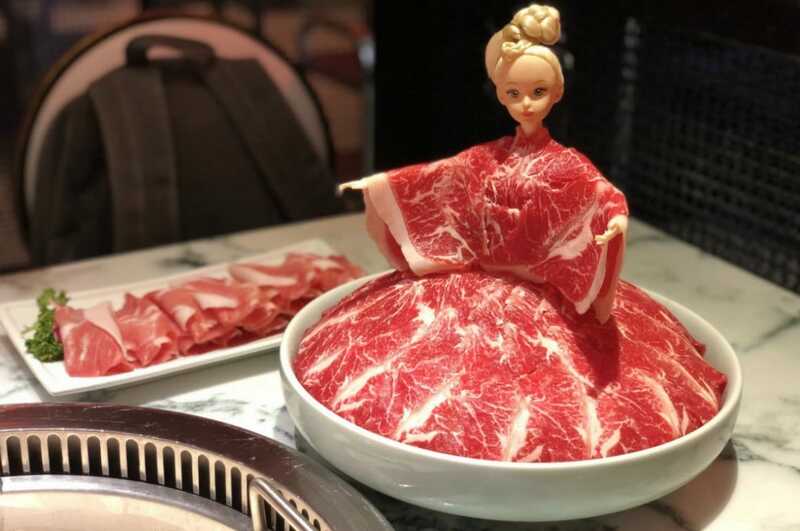 Little Sheep Mongolian Hot Pot is a well-known hot pot chain that was founded in Inner Mongolia in 1999 and has been sold to Yum Brands in 2011. 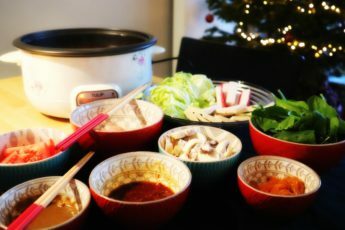 I would probably recommend anyone starting out with making hot pot at home to first try out the Little Sheep packages. The brand is well-known and trusted, its flavors are classic flavors, and generally not too spicy and easy on the stomach, especially the original plain soup base in the green package (below); this is the perfect base to start with, to which you could add fresh ginger, garlic, scallions, and if you like, chili peppers. The brand is readily available across the US and Europe too, in supermarkets, and via Amazon or in China from Taobao, usually priced around $25 for a box of five packages (within PRC it’ll be cheaper). If you prefer the spicier version, you can try the hot (red) package. 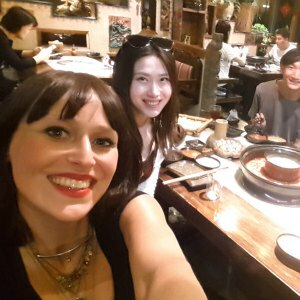 How I love these liquid hotpot soup bases by the Xiabu Xiabu brand! Xiabu Xiabu, like Haidilao and Little Sheep, is a Chinese chain of hotpot restaurants that was established in the PRC in the late 1990s, and now has hundreds of restaurants across the country. 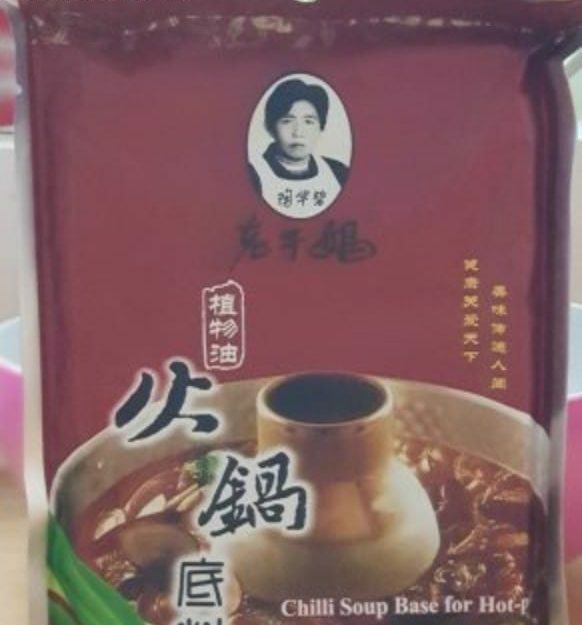 The Xiabu Xiabu brand soup bases come in 200 gr packages with liquid, perfect for smaller pots, many variations, and not too expensive (in China, varying from 13-18 yuan/$2-2,5). 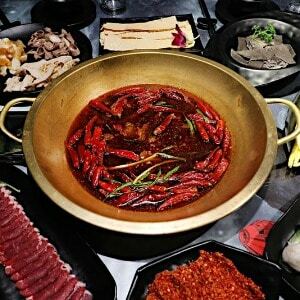 If I throw a hotpot party at home, I usually have one big pot with a spicy Sichuan, butter-type hotpot soup base, and one with one of the Xiabu Xiabu flavors, as they are again very different and do not sit heavy on the stomach. The Indian curry flavor (印式燃咖喱火锅底料) is very nice, as is the tomato version (番茄娘火锅底料), both not too spicy, quite mild, and just super tasty. I haven’t found these flavors available on Western online e-commerce platforms (please tell me if you know any sellers who sell them), but in China you can find these flavors at the bigger supermarkets and on Taobao. Haidilao is one of China’s hotpot giants and for this company, quality and service comes first. The soup bases by Haidilao are available in various classic flavors, and what I really love about this brand is how it also offers smaller packages that are perfect for solo hotpot dinner nights. 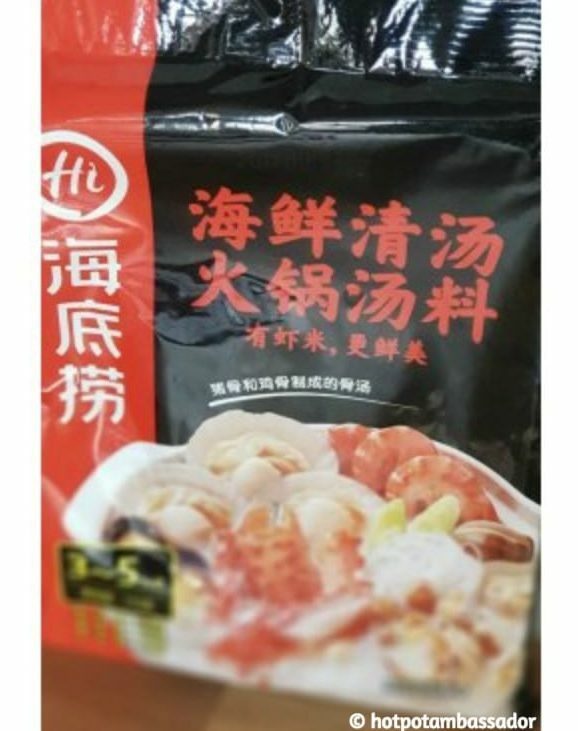 There is a non-spicy clear seafood broth available by Haidilao, perfect for customizing and adding fresh seafood or other ingredients. There is also a butter-type spicy hotpot base available, a tomato-based broth, a mushroom one, etc. 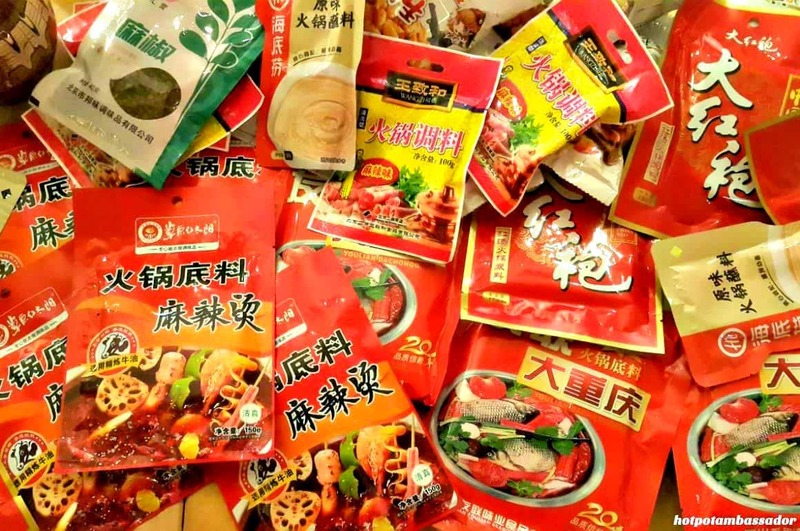 On Amazon, you can get an overview of the available products here, on Tmall and Taobao, Haidilao are readily available, but any Asian grocery store in the bigger cities of countries outside of China should also have some Haidilao options in their selection of hotpot condiments. Please share your favorite ready-made packages in the comment section below. If some of these hotpot broths become available on Amazon or Tmall (if there aren’t yet), please also let us know! Hi Manya! I have to ask: In the very first picture of this post, in the upper right-hand corner, there is a red-colored package of broth base with big white characters on it. What is the name of this brand?? The orange-colored package of this brand has proven to be my favorite broth base so far of all the ones I’ve tried (the red has too much peppercorn in there for me to enjoy, but the orange has just enough), but my local Asian markets stopped selling it, and I can’t seem to find it online without the name of the brand. The package is all in Chinese, so I can’t decipher it there. Do you know? Hi Victoria! You mean the upper right one in the featured image right? 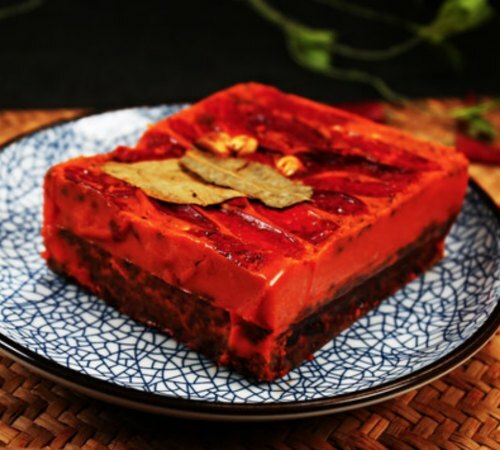 That is Dahongpao hotpot base (大红袍火锅底料), and I think the package you are looking for is this one: http://www.huahuamaoyi.com/mobile/index.php?m=default&c=goods&a=index&id=649. Correct? I have not been able to find that one outside of China, but in China, it’s very easy to purchase via Taobao or JD.com. They have various options, this is the red one: http://item.jd.com/10867044972.html. I hope for you that you can convince your Asian supermarket to put it back in their selection! SELF-HEATING INSTANT HOTPOT – HIT OR MISS?